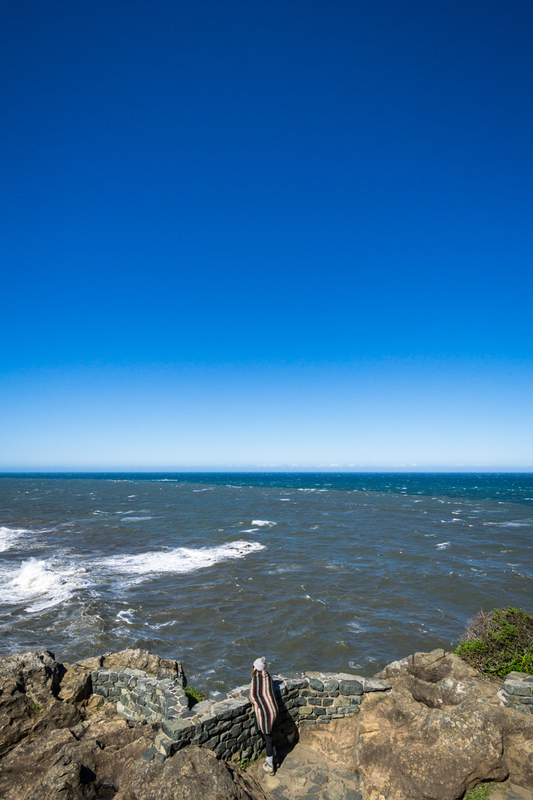 The highlight of Patrick's Point State Park, Wedding Rock is an overlook with an impressive view of the rugged California NorCal coast. With waves crashing at the base of rocky outcrop, the site has a magical feel to it, and I can see why many have gotten married at this site. Wedding Rock is located just 15 minutes north of Trinidad, CA. There is an $8 fee to enter the park, but the pass is good for the entire day and is accepted at the other state parks in the area. The top of Wedding Rock is visible from the parking lot - it really is that short of a walk! The trail drops down from the parking lot and is paved until you reach the stone stairs at the base of the rock. There is a side trail to the right of the main trail that lets you walk right up to the water's edge. That day was incredibly windy (like blow our beanies off/needing to lean into the wind to walk), so we skipped this and headed straight up the stairs to the top of the rock. All in all, a nice and quick stop to break up our road trip up the NorCal coast!